It is hard not to play favorites. I admit to having favorite areas within The Scott Arboretum. The Terry Shane Teaching Garden is near and dear as I personally garden and tend the space. The Harry Wood Garden features a fantastic array of choice bulbs and shrubs under the dappled canopy of Betula nigra. The Nason Garden provides playful contrast between textures while the Metasequoia Allee uses the prehistoric deciduous conifer to link campus buildings. Bond Quad, a residential area forming a quadrant linking Bond and Worth Hall, displays Cotswold style architecture. The buildings have a medieval feel. Small trees and conifers are used to soften the stonework. 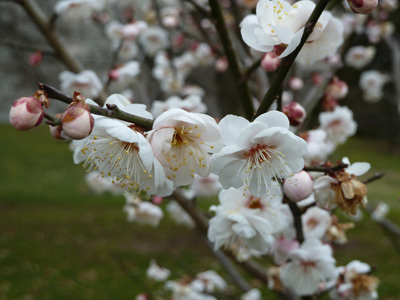 Prunus mume, also known as Japanese apricot or Chinese plum, is one tree used to balance textures. 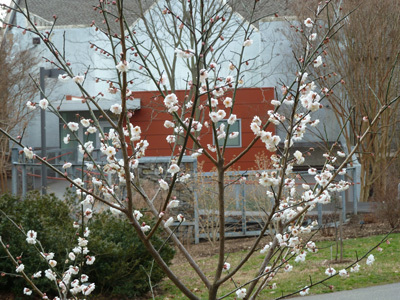 Native to China and Korea, Prunus mume has been in cultivation for over 1,500 years. The deciduous tree expanded outward, its range stretching forth to include Taiwan, Korea, Vietnam, and Japan. The flower blossoms of P. mume have been honored and celebrated in Eastern Asia for centuries. Poems, paintings, textiles, and cuisine all bear reference to the plant’s influence. 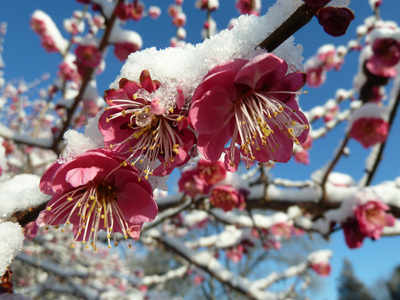 In China the plum blossom is honored as a symbol of winter and harbinger of spring. It is not uncommon to see P. mume in bloom under a blanket of snow. The plum blossom is one of four flowers, the others being the orchid, chrysanthemum, and bamboo, that comprise the “Four Gentlemen” of flowers. It is believed these four plants bear strong commonalities with the human virtues of loftiness, righteousness, modesty and purity. Each plant also corresponds to a particular season. The plum is linked to the spring season. While still relevant today, use of the “Four Gentlemen” was particularly popular during the Song Dynasty (960-1279). This deciduous tree typically reaches 20-40’ in height. Simple, green leaves 2-4” in length cover the tree. 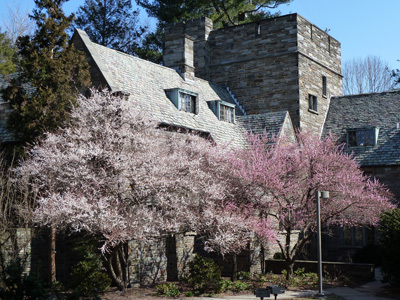 While the plant is understated during the summer and offers no color change in the fall, the true spectacle occurs in mid to late winter when the showy flowers open. 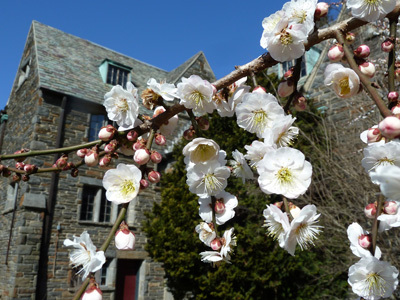 Starting as early as January and depending on cultivar, weather and site, Prunus mume blooms over the course of several weeks. One cultivar, P. mume ‘Peggy Clarke’ has been blooming for over a month and is still showy. Flowers are either single or double and come in shades of white, red and various hues of pink. After pollination, 1-3” fruits develop. In Asia the fruits are consumed in a variety of products ranging from plum sauce to pickled plum fruits. Consumption in the United States isn’t commonplace. At The Scott Arboretum the dropped fruits are collected and composted to reduce mess. A variety of insect pests feast upon P. mume. Aphids can distort new growth, especially early in the season. Borers may attack stressed trees and tent caterpillars can make webbed nests and eat the foliage. Keep trees healthy through proper cultural practices. Pay particular attention when leaves begin to flush out as this is the time when most insects attack. Hundreds of cultivars exist in Asia. While selection is reduced in the United States, diversity in flower form and color is possible. ‘Kobai’ sports semi-double pinkish-red flowers and produces a cinnamon-like fragrance. ‘Fragrant Snow’, recently planted on a bank near Old Tarble, is regarded as the best white, semi-double cultivar. It is also one of the earliest to bloom. For true pink double flowers consider the cultivar ‘Peggy Clarke’. Come walk the grounds of The Scott Arboretum. Now is an ideal time to observe Prunus mume in full bloom. 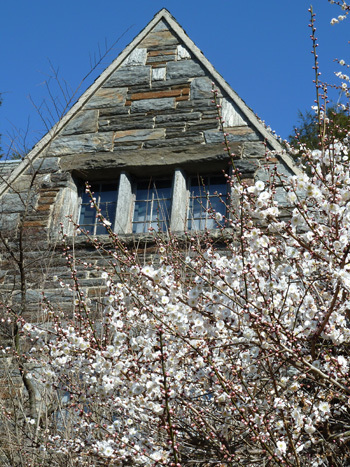 Check out the April 2012 Arboretum Event Calendar for other opportunities to experience the genus Prunus. I’ve seen Prunus mume in Japan, easy to get, so beautiful flowers! But in France, Europe, it’s kind of hard to find. Can we get cuttings or seeds by chance? I really love to have one! I have Prunus mume seeds!It is a pink,simple flowered tree I have,but I am looking for small seedling or seeds of Prunus mume ‘Kobai’ or other RED-flowered varieties!!! Joe is the best time to purchase thenm at nursery near you!